NASCO provides festoon systems and products for multiple applications and configurations. We are experienced in assisting our customers in the selection of products for their unique applications assuring their system is supplied with the correct Electrical, Hydraulic, or Pneumatic elements where needed, when needed. 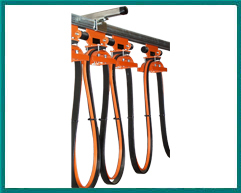 Festoon trolleys are available in multiple sizes with interchangeable accessories to accommodate cables or hoses, in either flat or round constructions or a combination of both. 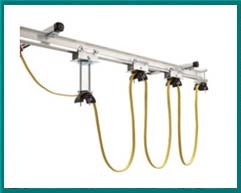 Systems are designed for I-Beam, C Rail, Wire Rope and even Curved Rail installations. 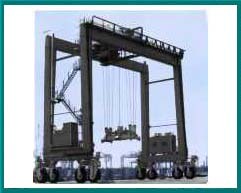 They include end clamps, intermediate trolley’s and tow trolley. NASCO can provide festoon systems for light to extremely heavy loads offering single and multiple saddle designs. Festoon systems feature easily maintained and replaceable main wheels that can be safely changed while the trolley remains on the beam. 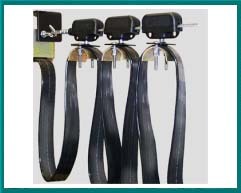 Side guide rollers keep the trolley running straight minimizing lateral movement and excessive wear, and special designed shock cords are incorporated to handle high speed systems.